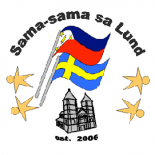 Sama-sama Sa Lund’s FILIPINO LANGUAGE CLASSES will start soon, as part of SSL’s Swedish-Filipino Integration project for the whole year of 2014. Schedule: Every other Wednesday, starting March 26. * Children’s group is at 17:00 – 18:00, and adults’ group is at 18:00 – 19:00. If you want to sign up, please send us the name of student, contact information (or name and contact information of parent), and which class the student will join (adults or kids). You can send a private message in the SSL Facebook page, or you can email samasamasalund@gmail.com, or text Erma Mårtensson (the event coordinator) at 0703058209. You can contact us for questions and clarifications, as well. Please spread the word! Tack så mycket! Maraming salamat! *So the dates are: March 26, April 10 (Thursday instead of Wednesday for this week), April 23, May 7, May 21, June 4. Classes will resume after the summer holidays, and will be held until the end of the year. This entry was posted on March 10, 2014 by Sama-sama Sa Lund in Events, Filipino language class, Integration and tagged filipino language, integration, language class, Lund, sama sama sa lund, sweden, tagalog.